Real Milk Paint Company Half & Half - Goosebay Sawmill and Lumber, Inc.
HALF & HALF from the Real Milk Paint Co. is a blend of pure tung oil and a pine oil solvent. It is suitable for interior and exterior work; it provides a low luster, durable and spill resistant sheen to all wood surfaces. Use Half and Half directly from the container; no thinning is needed. Half and Half is safe for food contact items. 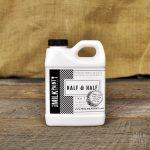 Gallon containers of Real Milk Paint Company Half & Half are available for $69.99 each. Contact us for more information.